January 4th, 2016. Web retailer Play-Asia announced that it will be providing an exclusive physical release for the upcoming English localization of Digimon Story Cyber Sleuth on the PlayStation Vita. Cyber Sleuth has already been set for a physical launch on the PlayStation 4 in North America and Europe, with the Vita version of the game as digital download-only. Play-Asia will be providing an Asian-English edition of the game identical to its North American counterpart, with physical options on the PS4 for $56.99 and Vita for $49.99. While the Vita and PS4 are not region locked, buyers should be aware that they will only be able to download DLC for Asian copies of the game using an Asian PSN account. Digimon Story Cyber Sleuth will launch on the PlayStation Vita and PlayStation 4 in North America on February 2nd, 2016, and in Europe on February 5th, 2016. Those that preorder the physical game will be able to obtain the exclusive Cherubimon Vice and Beelzebumon Blast Mode DLC, which will also be accessible digitally by buying the game during its first month of launch. Stop the presses! 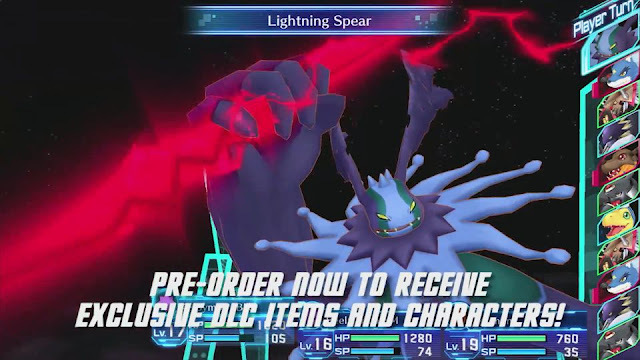 If you are smart you'll buy the digital western vita version, to show bamco that the digimon market in the west is large enough to consider releasing Next order in the west. You importing the asian vita version support the asian vita market not the western one.